Your content will be available directly within your calendar. Navigating dozens of apps to find your content is cumbersome and time consuming. As a consequence, platforms that bundle content from various sources have become extremely valuable and popular. A calendar platform can automatically pull relevant events from your apps, which means that you don’t have to spend time digging through those apps or manually creating events. 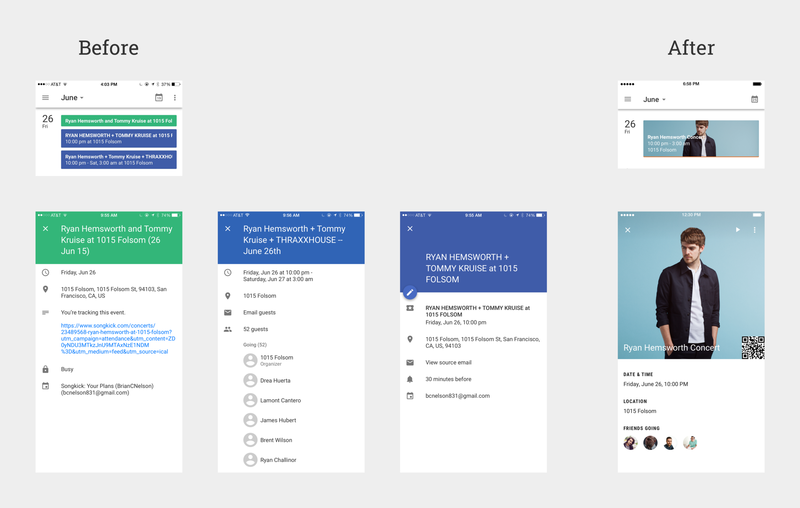 Compared with events you have manually added to your calendar, events pulled from apps can be far more comprehensive and informative — full of engaging and actionable components. Consumers now expect rich interactive media, and relying on static plain text is a huge missed opportunity. 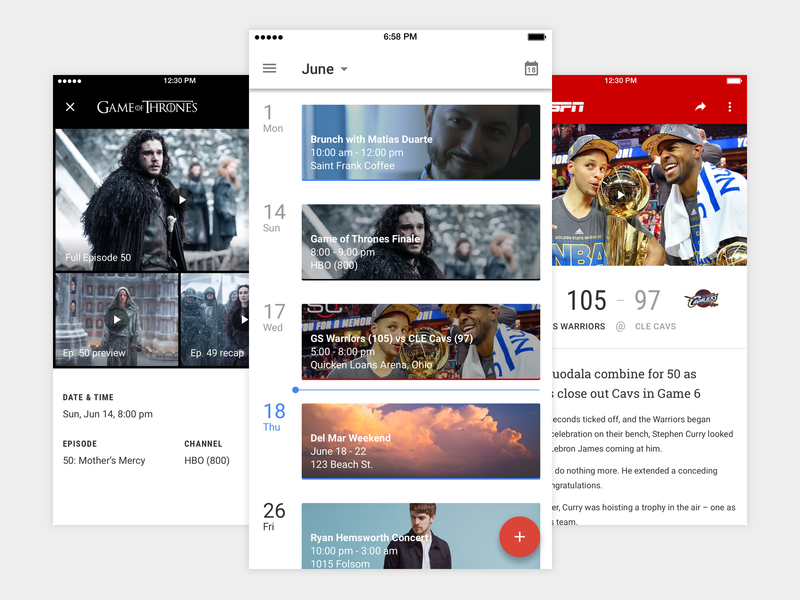 In my concept, your calendar will provide immediate access to media such as TV episode recaps (HBO GO), sport highlights (ESPN), and Tweets from live events. 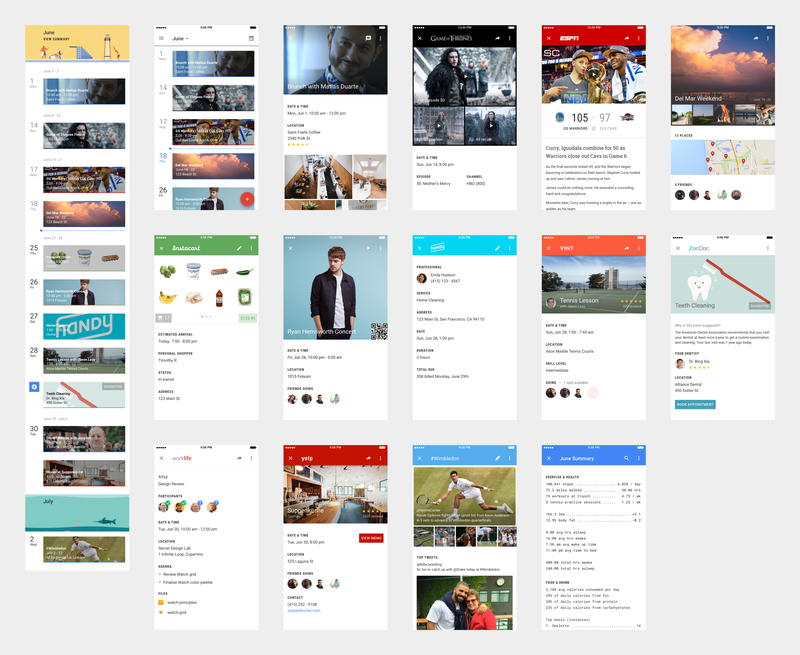 Google Now integrates over 100 third party services (and has plans to open access to all developers), while Google Calendar only connects with other Google services. Google should follow in the footsteps of Sunrise (acquired by Microsoft in February), and create an open platform for third party developers. Google’s recent acquisition of Timeful is an encouraging sign of their commitment to building a truly intelligent, assistive calendar. Your calendar will get you excited for upcoming events. In the future, triplicate event items from Songkick, Facebook, and Eventbrite are merged. The new event provides deep app links to the artist’s catalogue (in Apple Music, Spotify, or SoundCloud), getting you psyched for the show. Tapping the location reveals options to view the address in Google Maps or call a car (on the day of the event). The QR code expands when tapped, making it easy to check in once you arrive at the venue. Your calendar should make you feel at ease, knowing that everything you need is instantly accessible. Your calendar will evoke nostalgia. Your calendar should encompass all the fun things you do, and make it easy to look back and relive your favorite experiences. In this example, a calendar event summarizes a weekend trip with friends using photos, videos, profile pictures, and a map. The success of Facebook’s and Instagram’s core products attest to our basic desire to reminisce. Several tech companies have made more overt attempts to capitalize on this impulse—by reminding you of your activity a year ago today (TimeHop, Heyday, Facebook On This Day, Memoir) or summarizing an entire year of your life (Facebook Year in Review, Spotify Year in Music). Your calendar will suggest relevant events. Left: concept main calendar view. Right: event screen. Given how well your calendar knows you, and how much it knows about the world, it should suggest highly relevant events and appointments that you’d be sorry to miss. 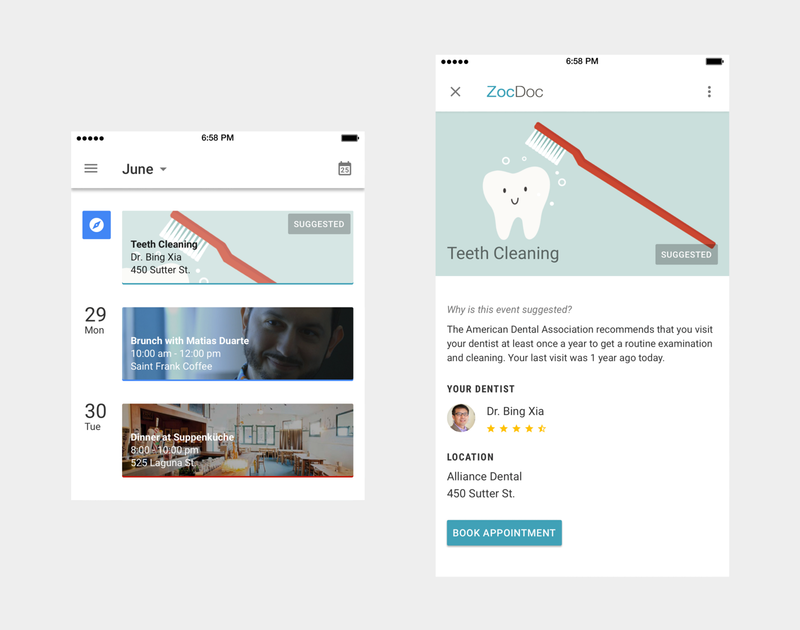 In this example, your calendar recommends a visit to the dentist, using your past calendar events and the information you’ve added to ZocDoc. Your calendar will respond dynamically to changing contexts. Read sequence from left to right. This flow demonstrates how your calendar will update automatically based on new messages you receive. In the future, you won’t have to adjust calendar events as details change. More importantly, you’ll never show up to the wrong restaurant because you missed a text. 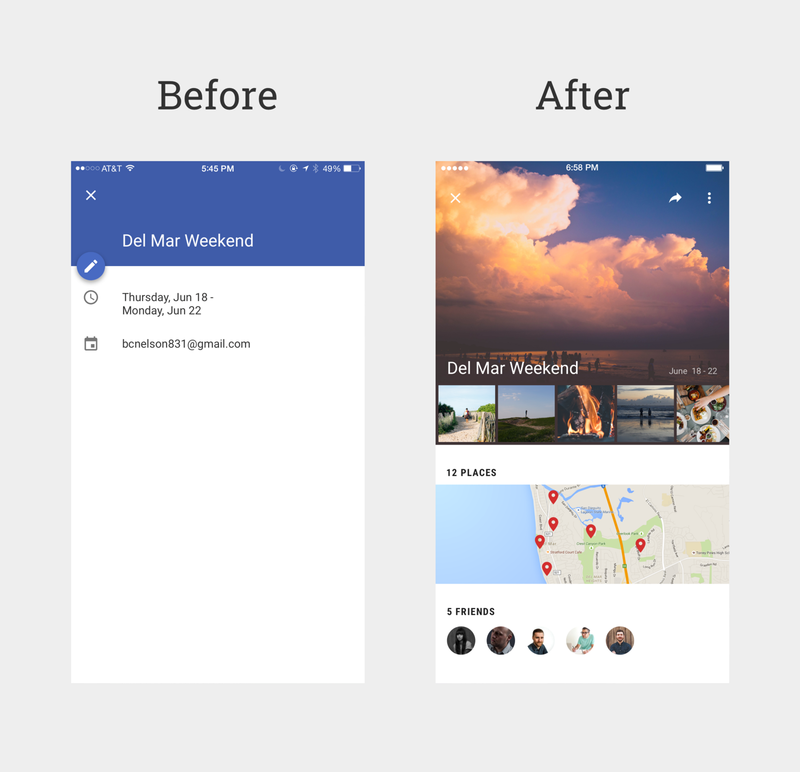 Google’s Now on Tap, announced at I/O 2015, understands context and intent deeply, and would enable dynamic event items as shown above. Your calendar will help you better understand your behavior, and recommend adjustments. The first step to changing your behavior is understanding it. 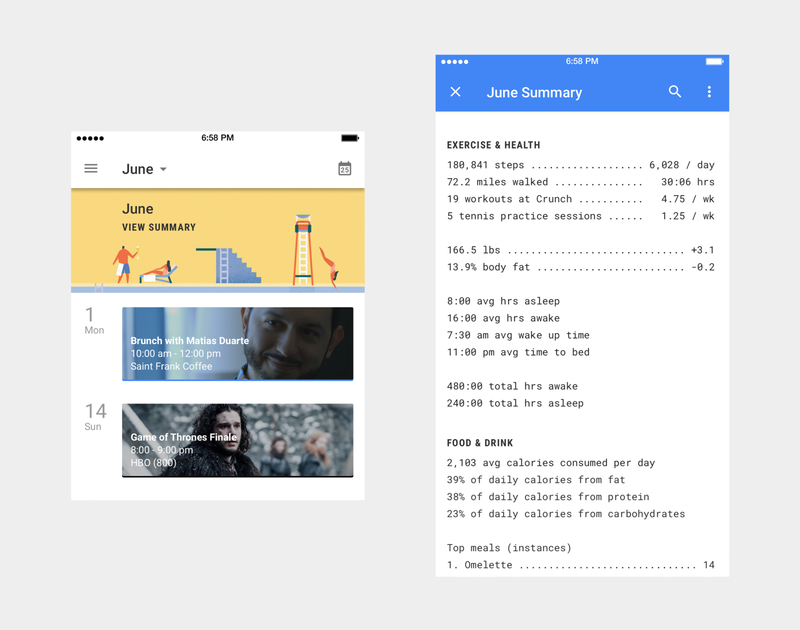 The Monthly Summary shown above is a receipt for all of your app activity organized by categories that matter to you, like health, social life, professional development, and personal finances. Note that the Summary doesn’t pass judgement on what you’ve done; it’s just a list of stats. The next, trickier step is creating a report card that makes encouraging and effective suggestions about what tweaks you can make to be happier, healthier, more productive, and better to yourself and others. Fitbit, Jawbone, Apple Health and a host of other health technology companies are all based upon this same premise, that easier access to and visualization of our data can change our behavior for the better. Companies like Reporter and RescueTime are similar, but seek to provide insights that improve our relationships with our loved ones and our work, respectively. Calendar is a natural place for an aggregation of individual events. Summaries (daily, weekly, monthly, and yearly), comparisons, trends, and correlations could all prove valuable. Try the prototype below by scrolling and tapping on event cards! Here is a collection of all of the use cases I explored. I don’t work for Google, and this calendar is not under development. This is just a concept, for practice and fun. Thanks to Andrew R McHugh, Evan Simoni, Nicholas Felton, and Amber Illig.